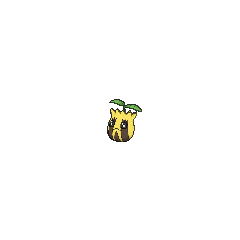 Sunkern in game: 2,696 Who? Important notice! Pokemon Sunkern is a fictional character of humans. Sunkern made its debut appearance in Moving Pictures. Ash, Brock, Misty, and Todd Snap found it frozen in a field. Ash eventually evolved it using his Sun Stone from The Bug Stops Here, and it summoned more Sunflora so that Sophia and Marcello could take a picture for their golden anniversary. Sunkern also appeared in Pokémon Ranger and the Kidnapped Riolu! Part One. 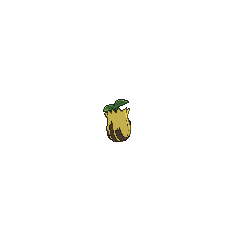 Sunkern also made a brief appearance in Giratina and the Sky Warrior and Arceus and the Jewel of Life. A Sunkern's fossilized leaf made an appearance in a flashback in Ancient Family Matters!. 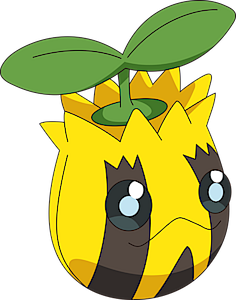 A group of Sunkern appeared in Zoroark: Master of Illusions as a few of the many local Pokémon who lives in Crown City. Some took part in surrounding Zorua in the park along with the other Pokémon to prepare to attack him, angry at Zorua for what Zoroark did to the city. Before a fight broke out, the Sunkern, along with the other Pokémon, were calmed by Celebi. In Sunkern Treasure, Gold encounters a herd of Sunkern escaping from a wild Skarmory. To help Falkner capture the Skarmory, Gold captures a Sunkern to use her jumping ability to get high enough and attack it. Afterward she was named Sunbo and later evolved into a Sunflora through a makeshift Sun Stone. 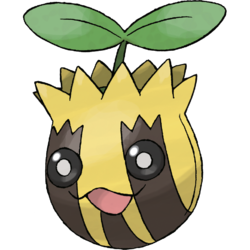 Another Sunkern was one of the Pokémon sent to help the fight in Ilex Forest in The Last Battle XIII. 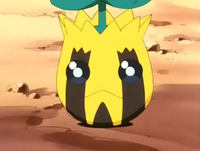 Sunkern has the lowest HP of all Grass-type Pokémon, is tied with Lotad for the lowest Defense of all Grass-type Pokémon and is tied with Bellsprout and Seedot for the lowest Special Defense of all Grass-type Pokémon.